Sindarius Thornwell was named the SEC Player of the Year last week. March Madness is a strange beast. 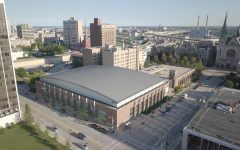 For about 10 weeks you’ve grown accustomed to seeing the same group of teams that roll through Milwaukee every year. 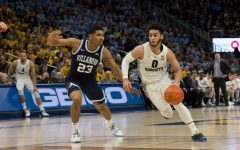 Even Marquette fans who know pretty much nothing about college basketball outside of the home team still probably remember that Villanova is very good and DePaul is not. You might even recognize a bunch of players from last year. Then March comes and suddenly, your first-round opponent might as well be from Neptune. South Carolina? The last time Marquette played them was over a decade ago when Steve Novak was still in school. Unless you have as little of a life as I do and spend a ton of time watching college basketball, you probably haven’t caught a lot of SEC games this year. Well, there’s only one player you really need to know on South Carolina. One guy that stands out pretty clearly from everyone else. He’s a 6-foot-5 wing player named Sindarius Thornwell. 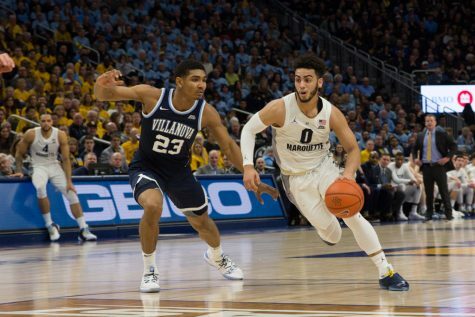 For Marquette fans, he is the new bogeyman. 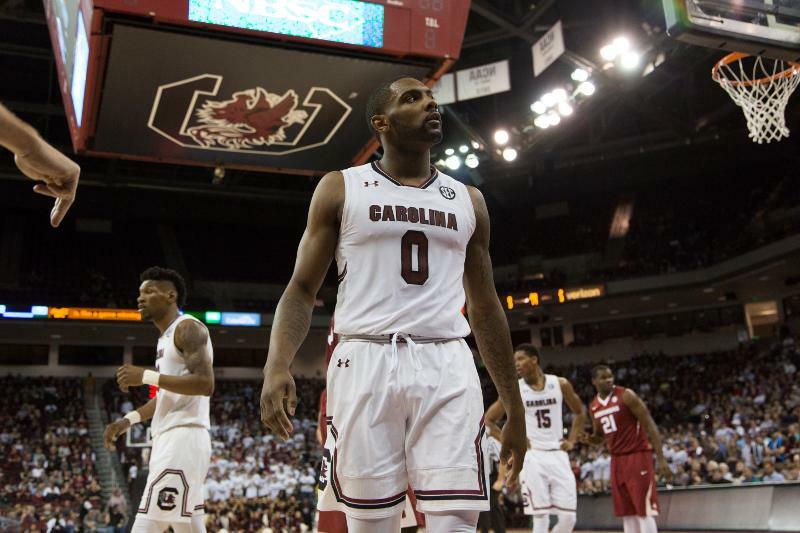 Thornwell is South Carolina’s senior leader and a Swiss Army Knife of a player. You want points? He tied Kentucky freshman Malik Monk – the same guy that ranked eighth in a recent NBA mock draft – for the SEC scoring title. Rebounds? 7.2 per game, better than every other listed guard in the conference. Dunks? Enjoy. It’s little wonder that the Gamecocks won the first 12 games they played this year with him in the lineup. 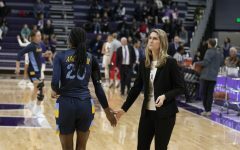 The Golden Eagles haven’t had an easy time defending anybody – their adjusted defensive efficiency ranks 59th out of 68 tournament teams – but Thornwell is an especially harrowing challenge. Just look at these two gifs from his 44-point explosion against Alabama this year and see if you can detect a trend. Yep, Sindarius Thornwell isn’t afraid to go right at other players to draw fouls. KenPom says that he draws 7.4 fouls per 40 minutes, which is the 14th best mark in the country. 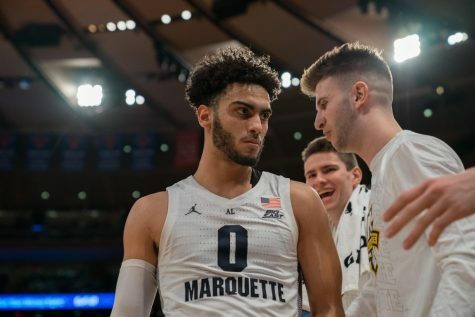 To add some context, DePaul’s Billy Garrett averages a full foul per 40 less and he’s the highest-ranked player that Marquette has seen this year. But that’s not the end of the story. On this play, teammate Seedee Keita sets a screen for Thornwell on the right wing that picks off Thornwell’s defender for a split second. Once he catches the ball off the curl, there’s nobody in front to shield Alabama’s bigs. That means Thornwell can launch himself at the hoop, forcing the defender to either give contact or let up an easy bucket. 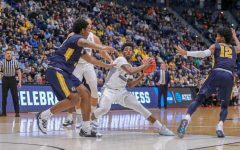 If Marquette’s pick-and-roll defense remains as porous as its been all year – read more about that here – then whoever plays center is going to be responsible for not fouling. 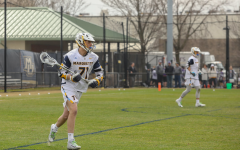 The only two true bigs Marquette has on the roster are Luke Fischer and Matt Heldt, neither of whom are good at foul avoidance. Fischer ranks 65th in fouls committed per 40 minutes among the 66 BIG EAST players that played the minimum number of minutes to qualify. Heldt, who averages over six fouls per 40 minutes, would have been 66th out of 67 if he’d played enough to qualify as well. 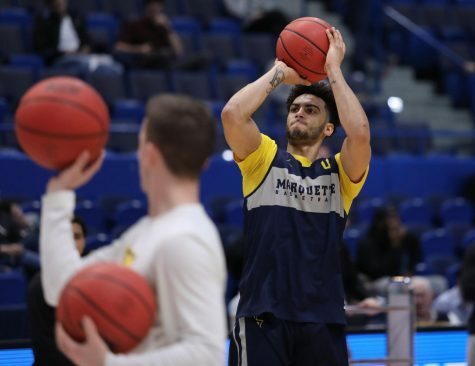 Here’s the upshot: In order to stop Sindarius Thornwell from getting to the line over and over again, Marquette will either need to tighten up its pick-and-roll defense or the bigs will need to contest close shots without leaning into the shooter. You’d be hard-pressed to find consistent examples of those things amid a 31-game sample size. That’s not the only matchup problem Thornwell poses, though. He also has a nose for the ball on the offensive boards. He’s not a glass-eater like Angel Delgado of Seton Hall or Ethan Happ of Wisconsin. If you box him out, he doesn’t have the size or wingspan to take advantage of the full range of rebounding angles like those guys do. However, Thornwell is not the kind of guy who will start running back down the floor after a shot attempt either. If the defense is lazy about getting a body in place, Thornwell will use his quickness to snag a board. 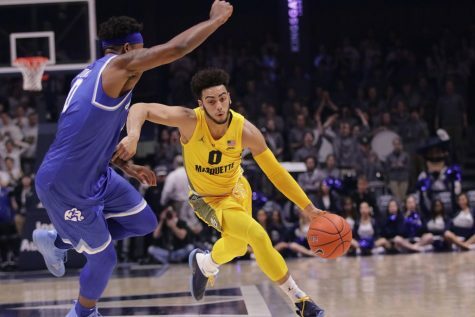 Marquette is pretty middle-of-the-road as far as preventing offensive rebounds goes – 165th in the country of 351 teams, according to KenPom. 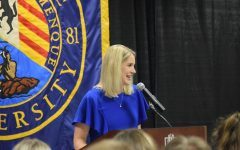 That doesn’t mean the Golden Eagles have been good against proficient rebounding teams, though. Just go back to last game, where Delgado snagged eight offensive boards. A lot of them were like the one below, pretty much uncontested because of a late double-team on the shooter. These are exactly the kind of rebounds that Thornwell can get. These are by no means the only two things that Thornwell does at an above-average level; just the things that are most likely to cause problems for Marquette. 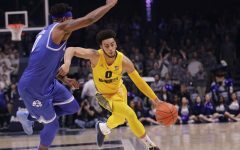 He’s also a solid finisher, a smart transition player and an adept enough dribbler to bring the ball up the court, even though point guard is not his natural position. If we had access to more South Carolina game footage, it would also be worth highlighting his superb defense. Suffice it to say that Thornwell has been named to the SEC all-defensive team in back-to-back seasons. The docket for Marquette’s defense should have one item on it and one only: stop Sindarius Thornwell. That’s obvious advice, but it’s all the more important in this case when you consider that he’s the only real offensive threat the Gamecocks have. South Carolina ranks 315th in effective field goal percentage, a weighted metric that gives 3-pointers more value. How bad is that ranking? It’s closer to the worst mark in the country than it is to the second-worst tournament team. 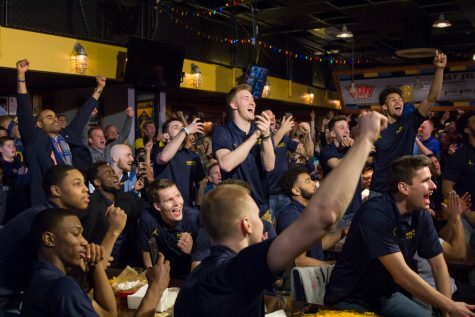 Thornwell is going to make an impact no matter what Marquette does, but taking away his teammates will greatly lessen South Carolina’s chances of winning. Of course, there are also a few things Marquette could change to limit Thornwell’s scoring. 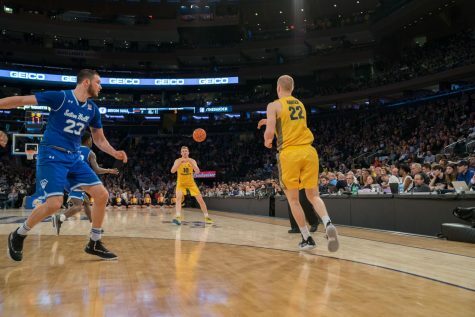 Aside from the aforementioned tips of not getting lost on screens and avoiding fouls, it would be helpful to play a step further back than normal. Thornwell isn’t a bad jump shooter, but he’s not great either, especially when a closeout is there. 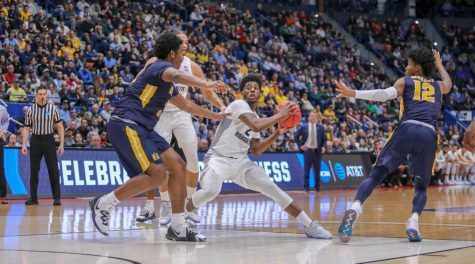 Playing just a bit off of him and going under screens would give Marquette’s defense more time to react to his drives. 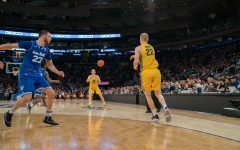 It’s not ideal to give anyone an open look, but against a player of this caliber, it often comes down to choosing the best of the bad options. Daring Thornwell to make partially contested jumpers is a better strategy than taking chances with any kind of dribble-drive. The other effective strategy is one Marquette has pursued for this entire year: score your problems away. South Carolina is only 2-7 when opponents score 70 points or more, a mark that is more than three points below the national median. Marquette has exceeded 70 points in 26 of 32 games. Admittedly, the number 70 is an arbitrary figure, but it does highlight two important truths: South Carolina cannot keep up with good offensive teams and Marquette is a good offensive team. Those will remain true regardless of what Thornwell does. There are plenty of reasons to be worried about this matchup, from South Carolina’s stingy 3-point defense (fifth in the nation) to the game’s location 45 minutes from the Gamecocks’ home arena. And of course, there’s Thornwell, one of the best players in the country. 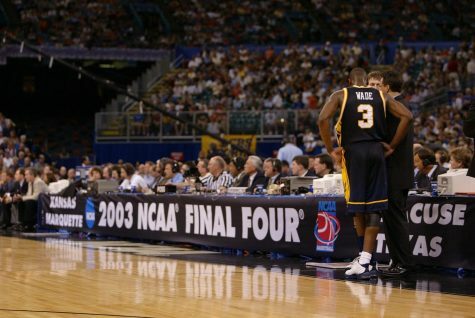 He will impact the game regardless of Marquette’s game plan. 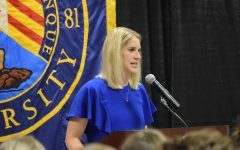 The question is whether the Golden Eagles can mitigate enough of the damage to come away with a W.